Very good point and nice chart. I'm not familiar with the history of the Metro system, but perhaps this was also caused by the original design? The lack of development around Fort Totten always baffled me since it is a transfer station for the red and green lines, but I'm glad the Walmart and Art Center are proceeding. Hopefully that leads to much more. I chose a 1/4 mile buffer because most people say that that's the most a typical person is willing walk on each end of a train commute. The people who live or work within that circle are the most direct beneficiaries of the transit station, and in order to spread the cost of the infrastructure investment to as many people as possible, it makes sense to build densely to maximize the number of workers/residents who will use it. You are right, that it would be interesting to see how density changes if you use a 1/2 or 1 mile buffer. 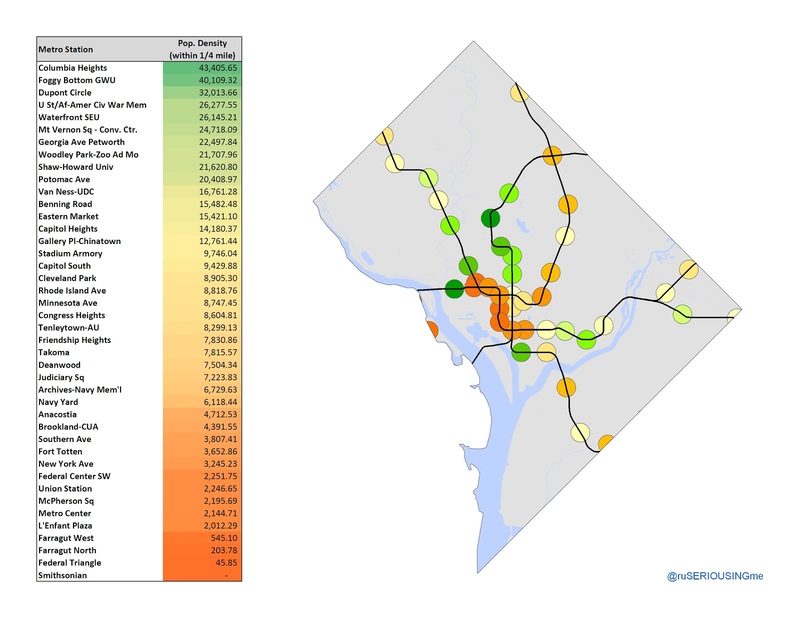 "The worst offenders (Smithsonian, Federal Triangle, the Farraguts, L'Enfant, Metro Center...) are all in the Central Business District where office demand outbids residential for the limited space available, explaining the low population density." The counterparts to residents are jobs and extra-curricular attractions (shopping, parks, museums, etc), and this measure does not consider the either of those latter measures of activity. I titled the post Transit Oriented Housing rather than Transit Oriented Development, recognizing that I would only be capturing one variable involved in development. 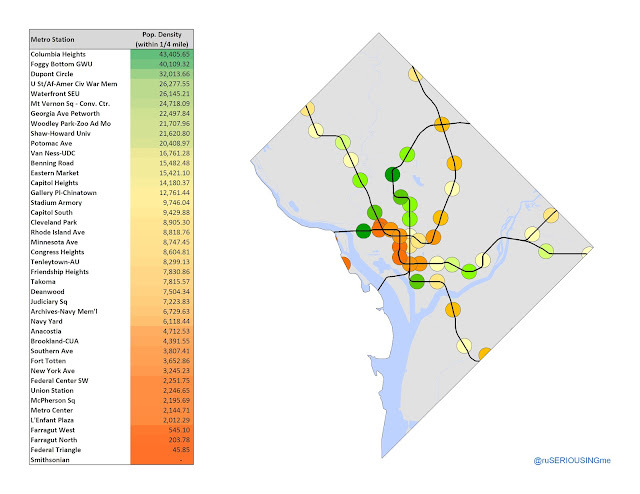 That said, there are some metro stations on this map that you know are in predominately residential neighborhoods (Fort Totten, Southern Avenue) and the metric is an indicator of how "underdeveloped" (obviously I am using this term subjectively, with a biased set of values about how land and infrastructure should be used most efficiently) the areas around those stations are. It would be interesting to add some other factors to the analysis. Perhaps combining employment density with residential density to get some measure of the overall intensity of use. Likewise, it might be interesting to compare the residential densities against an adjusted average density for DC, perhaps taking out the rivers and large parks from the equation (in order to get a more useful density number for land that's developed and developable). Cool map, however. The general point about housing stands. Actually, if you want vibrant neighborhoods, maybe you want a good deal of office buildings, retail, and nonresidential construction on top of adjacent to, and very near (within 1/4 mile) of MOST metro stops. People use metro when it is convenient, safe, and is efficient (as in trip chaining). When there is "just" dense residential development around metro stations, it is an advantage for the people right on top of the metro station, but it will tend to not "drag in" others that see vibrancy around that station and opportunities to walk not just to make the commute but also due other chores or meet other needs. I live in American University Park. The tenleytown station could benefit from some more dense development that included residential. But i think commercial, retail, and other development might be even more important in terms of driving actual use of the metro for commuting and other purposes. As for Fort Totten, i've looked at the neighborhood demographics and as the satellite picture clearly demonstrates, there is not much unoccupied or vacant developable land in the area. There is suburb like lower density development in place. It reflects the settlement and development patthers of 30-50 years -- well before Metro became a major influence in that neighborhood. It will take 30-50 years for "re-development" to change the neighborhood. To expect more may just be unrealistically impatient. On the bright side, Brookland is densifying near the metro station incredibly quickly. A couple projects are already open(ing): Chancellor's Row (http://www.eya.com/Chancellors_Row_at_Brookland_Metro) and the Artspace Lofts (http://dc.urbanturf.com/articles/blog/artists_welcome_brookland_artspace_lofts_opens/4443). And one much bigger development has already begun digging its requisite pre-construction pit: the Monroe Street Market (http://www.abdo.com/urban_communities/index.htm). Across the tracks on my side of Brookland, near the 12th street corridor, is the so-called Colonel Brooks project, after the tavern being demolished to make way for it (http://www.901monroe.com/Facts.htm). Of course, much of this new development has faced vociferous opposition from neighbors, but I've been heartened to see other Brooklanders express support for bringing new residents/shoppers/neighbors into the area. Hopefully the redevelopment here will be successful enough to spur similar transit-oriented development around other metro stations (I know Fort Totten has at least one big development opening soon as well, and I've been watching the Rhode Island Row apartments get closer to completion near the RI Ave. metro with every passing day). Thanks for the interesting map, and good job drawing attention to the problem; I just wanted to share some of the good news, too.